If you’re looking to store chemicals, a custom chemical storage room will allow you to maintain your hazardous materials with the highest safety standards. This means you can achieve compliance and protect your personnel with a chemical storage room engineered to your specifications. Meeting regulations and creating a safe storage environment is essential to protecting your reputation. First you should understand the chemical storage regulations in place at the federal, state, and local levels. Knowing the hazards associated with the chemical you intend to store, our sales team is able to engineer the perfect custom chemical storage room for your unique storage needs. In addition, there are countless ways to customize your chemical storage room using any of our available accessories, designed to facilitate the chemical storage process and provide increased protection. Your chemical storage room specifications may include dimensions as well as construction type. Depending on what sort of chemical you intend to store, we’re able to construct a chemical storage room that meets its storage requirements and protects your inventory as well as your personnel; for instance, if your substance is flammable, it should require fire rated construction. Also, depending on the amount of materials you intend to store, your chemical storage room will be constructed with a leak-proof containment sump of custom dimensions. In addition to custom construction, your chemical storage room may come equipped with any of our accessories. 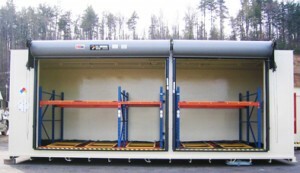 Shelving, racks, and ramps can facilitate the chemical handling process while fire suppression systems provide additional protection against fire hazards. We offer accessories that reduce the risk of fires and explosions with superior engineering and protective housings. No matter your requirements, our chemical storage rooms can be customized to suit your needs. With the highest safety standards and our industry-leading 15-year structural warranty, you know you’re getting a product that’s unmatched in protection and quality.